Woot! Urban Eats starts next week -- 3 courses for 30 bones. Anyone wanna join me? I wrote a few weeks ago about the opening of Tavern Law, a new speakeasy-type bar nestled into an inconspicuous shopfront. Today's Seattle Times has a great article on the joint, as well as a listing of some other "undercover" bars around town. The irony isn't lost on me - giving press to these faux speakeasies, when real Prohibition-era speakeasies could never have survived a day had they been outed. But, it's good to have a handy guide of where to go for a classic, throwback drink. From the very first time I visited Eugene, OR on my college-scouting mission, I knew I'd end up in school there. Sure, the town was cute and not too far from home. Yes, I had family living there, which made it feel not so lonely. The college itself was pretty great as well. But it was the tomato-cheese soup that sealed the deal. Just off campus from the U. of Oregon sits an inconspicuous old home converted into a restaurant, sandwiched between a sorority house and a 7-11. It's really unassuming, yet is always jam-packed with students and town-dwellers waiting in line for a seat while discussing the latest Ducks game, or crowding around a table full of coffee-cups and intense, eager-freshman existential debate. To be frank, alot of the food is quite mediocre. It gets the job done -- relatively cheaply and with large portions to boot. But overall, most of us could whip up a garden burger slathered in avocado and mayo, or a scramble of sun dried tomatoes/feta/and spinach. 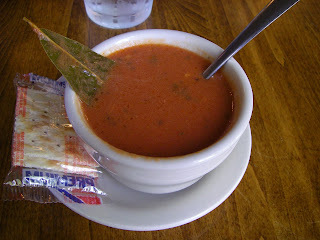 But that tomato-cheese soup, oh my! It seems so simple - a tangy tomato base flecked with ribbons of basil or an occasional whole bay leaf. There's a tinge of fresh-pureed-tomato texture, though it's not at all what I'd call chunky. Except for the strips of cheese, this soup doesn't have a lot of texture. Yes, the cheese has a toothsome bite - it doesn't go all melty once it hits the hot soup. This fact -- that cheese -- kept me up at night for many an evening in Eugene (well, that and the 20-course-hour load of homework and a healthy tendency toward being a night owl). How does it stay intact? Last weekend, my guy and I took a roadtrip back to Eugene to watch the Ducks vs the Utes and drum up a little nostalgia. We met up with another alumna friend of mine for the game as well as a post-victory stop at the Glenwood. (We actually went for breakfast, too, but I didn't get my soup so had to hit up the cafe again before leaving town.) The same mystery prevailed: That darn cheese was not melted. It swam daintily alongside the herbs in a pool of tomato bliss. In shreds. So, I am taking the mystery to the blogosphere. If anyone out there can help me sort out this quandary -- better yet, provide me with the recipe, I may actually, finally get some sleep. Just a quickie here to tell you that it looks like Skillet St. Food has finally recognized that Seattle is a vegetarian-friendly place - and created their own veggie burger. I can't tell you how many times I've gone to Skillet with hopes of eating, only to have them dashed when all that's being served up is meat, meat, meat. The new burger features a delish-sounding concoction of toppings: mushroom jam + arugula + cambazola atop a buttered Macrina soft roll. It's set to debut this week; perhaps my guy and I will check it out on Sunday pre-Seahawks game. 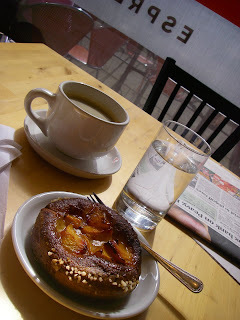 Enjoying a lovely Sunday a.m. Americano and peach brioche at Colville St Patisserie. The food in Walla Walla is amazing! A true oasis. 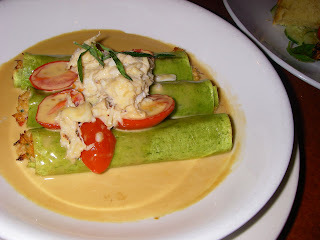 May have died and gone to heaven surrounded in anise-sherry cream sauce over crab canneloni at creek town cafe in walla walla. This weekend marks the six-year anniversary of when we officially moved in to our little abode north of Greenlake. Part of the reason that we bought a house in the first place, so goes the joke between my husband and I, was so that we'd never have to move again. All the sorting, packing, lifting, re-sorting, unpacking -- it's just too much. Especially when one has an overflowing heap of kitchen gadgets, place-settings for three average-size families, and enough cookbooks to start a small food-only themed library. As books go, I've always loved keeping them around. Scan the multitude of shelves in our house and you'll find remnants from school days (journalism and history text books intermingling with Dickens and Plato), legions of photo-rich travel guides, biographies in homage to many of our favorite bands (I count at least 4 on The Who alone), an entire shelf dedicated to writing and reference books for our home-office, and scores of tattered, trendy novels, flaunting their pool-side warp. But it's the cookbooks that get me really riled up. When we remodeled our dainty kitchen a few years back, a built-in to house the cookbooks was a critical piece of the design (that and the built-in wine rack, but I digress...). Today, those three dedicated shelves on the corner by the stove are tightly lined with colorful cooking guides of all shapes and sizes. The next shelf down rests my go-to collection: The first-ever cookbook I received at approximately age 6 (which I still consult when making apple crisp). A bound collection of my family's best recipes (Every Christmas, mom adds to this collection, typing the best finds from that year and printing up copies for each of us to insert to our binder. It's hands-down the best gift every holiday.). The best vegetarian cookbook I've ever found, given to me by my college roommate during the first year we shared an apartment. Of course, Joy of Cooking. The bottom shelf houses the over-sized gems: a hardbound copy of Jamie Oliver's The Naked Chef, signed by the chap himself (swoon! ); the Zuni Cafe book I've read cover-to-cover but haven't yet attempted to cook from; the hefty Vegetable "bible" my aunt gave me when I announced my vegetarianism; a profoundly detailed Baking Illustrated guide from the geniuses at Cook's Illustrated magazine (actually a gift to my husband, the baker, but I peek at it! ); Cafe Flora's own tome; and a well-loved Sunset Cook Book for Entertaining from 1968 that contains my secret sangria recipe (guess the secret's out). I haven't even begun to tell you about the scores of Food + Wine magazines stashed beneath our bed. Sometimes I sit, cross-legged on the linoleum floor, in front of the shelf and gaze at them, occasionally pulling out a book or two to flip through for inspiration. Or I just look at the pictures and imagine the feasts I could make. Or I reminisce about the memories -- where I first tasted a dish, where I picked up the book, the smell of that pie baking in the oven. And sometimes, like today, I begin leafing through the shelves, selecting a book here, a book there, piling one atop each other on the floor next to me until it's nearly half my seated height. Today's stated goal was to devise a menu for a Monday-night dinner party, in belated observance of a dear friend's birthday. It's turned into me sitting amongst towers of books from all eras, lustily thumbing through the pages, dog-earing corners and sticking in tufts of scrap paper as a reminder. I can't imagine a better way to savor the morning. I'm so glad to have lugged all of these books around with me, all these years.